Author's cut of the article as it appears in the March 2013 edition of New England Baseball Journal Magazine. 03/15/13: Jonathan Pollard was a kid in a candy shop. 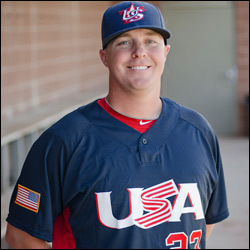 The Dracut, MA resident and owner of The Cage Baseball & Softball Training Center in Woburn, MA had been the pitching coach for the Women�s National Team within USA Baseball since 2011. This January, he was invited to attend the American Baseball Coaches Association National Convention in Chicago. When he arrived, he attended a meeting with some of the top head coaches in the country. In the room were Dave Serrano, head coach of Tennessee and former Collegiate National Team, current Collegiate National Team manager Jim Schlossnagle, Scott Brosius, New York Yankees legend and manager of the 18U National Team, current 18U National Team manager Rob Cooper of Wright State, as well as head coaches from some of the top baseball programs in the country, including #1 ranked Arkansas and #24 ranked Texas A&M. The CEO of USA Baseball and General Manager of each division were also at the table. The purpose of the meeting was to prepare new managers for the upcoming year. And then it happened. Team USA offered him the Manager role to lead the Women�s National Baseball Team. Jonathan Pollard had played college baseball for Salem State in 2002. He then joined them as an assistant coach in 2003. Later that year, he coached women's baseball for the first time, leading the Lady Spirit (the women's team version of the North Shore Spirit of the CanAm League) to a Women's National Championship. The Lady Spirit evolved to the New England Sox, where they won four more national titles from 2004-2007. In 2008, Pollard founded the Stable Baseball Academy out of Extra Innings Woburn, and with that, became program director for the New England Stampede in the New England Elite Baseball League for youth baseball players. He moved to his own facility, The Cage, in 2010. In 2011, Pollard was assigned as one of eight USA Baseball women's coaches, and in 2012, a World Cup year, was assigned as pitching coach. The team won Silver Medal in Edmonton, Canada after losing the gold medal game to Japan. All the while, Pollard played a little ball himself in the Boston Yawkey League, Boston Park League and Boston Men�s Baseball League. From 2007 through 2009, he won three straight MVP awards while playing for the Tigers and White Sox in the BMBL. Pollard turned 33 this past October, and is believed to be one of the youngest managers to lead any of the USA Baseball teams. Ashley Bratcher is the Director of Operations for Team USA. I asked her why she hired such a young guy from New England to lead one of the most premiere teams in the country. �I don�t think age or geography have anything to do with someone�s ability to be successful in a leadership position. Jonathan has a drive and passion that is contagious and that coupled with his knowledge of the game will allow him and the program both to be successful. Jonathan has been with the program for two years now in mostly a pitching coach capacity, however, despite his role has maintained the respect of the athletes and has consistently been someone they have gone to for direction and leadership. Making the move from pitching coach to manager was a natural next step given what he has provided the team. While coaching the Women�s team is quite an honor, I couldn�t help but ask about his future aspirations. Pollard reports to Cary, North Carolina this July for the Women�s National Team Developmental program. There, he will evaluate the top forty players in the country with aspirations of being selected to the final 20-woman roster in 2014. It�ll be sweet.